This is a selection of the photographs that are most memorable for me from the year that was (2017). Are they the best I've taken this year? I am probably not well placed to say, but I do know that for each one I felt something profound as I stood where I stood to capture the scene. Maybe excitement, maybe a deep sense of peace, maybe a connectedness, maybe wonder. Read on to discover more about my thoughts and please comment. The captions tell you a little about the images and how I felt taking them. And if you'd like to keep up with new images, stories, reviews and lessons as they appear on this blog, then just use the form at the end of this post to sign up. The Hidden Path to Black Eagle Rock | Sometimes the world opens up and reveals a secret. It felt exactly so as I watched the ocean give way to these eroded features, revealing a secret path to the black rock at the edge of the ocean. The images all have a few qualities in common, some obvious and some less so, and they also mark my progression as a photographer. They are all 'real' scenes taken away from the studio, in the light of day with all its vagaries and fickleness. For me, nature is something wondrous and terrible to behold, and this sense drives my choice of photographic subjects. Blue House Wink | The sky grew in colour and revealed the house 'winking' just for me. Most clearly, each of the photos features water. If not central to the image, water is at least present and significant. Water holds a fascination for me, especially when it is blurred by longer exposure times. It passes by, ebbs and flows, burbles and roars, and shapes the world in which we live. Photographing water, I feel a sense of time and the ages in a way that I don't get photographing anything else. 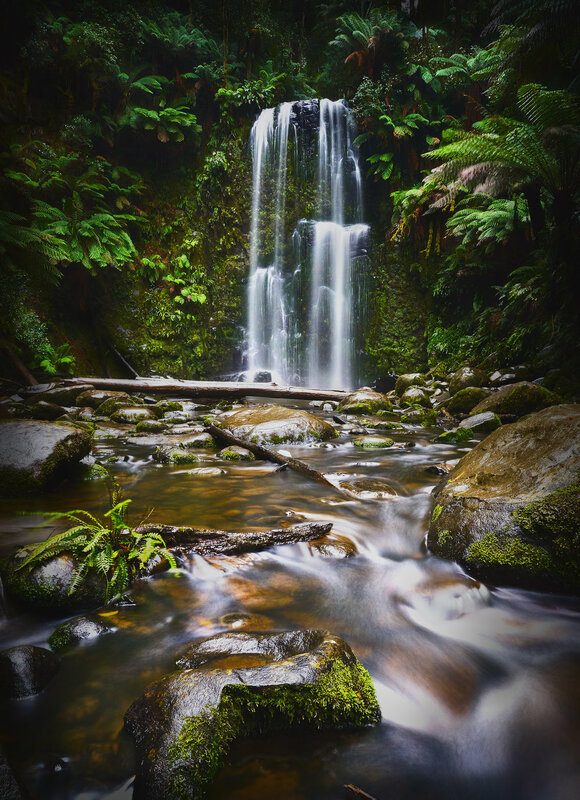 Beauchamp Falls | Standing in the river to take this shot, feeling the cold spray from the falls and immersed in the sounds of the water crashing on rocks at the bottom of a deep valley of ferns and tall gum trees made me feel connected to life. I have been focussing on basic composition: leading lines, foreground and background. Each of these photos reveals my maturing skills. My idea in each composition was to control and lead the eye through form. Although these are all colour images, I feel they have the structure to function as monochromes. In some cases, as in Blue House Wink, the leading line is very geometric and blatant (the jetty). But in many cases, the visual direction comes from foreground elements that function collectively as waypoints for the eye. In The Hidden Path to Black Eagle Rock for example, the stepping stones make you want to step out and walk to the distant outcrop. In The Eyrie, the edge of the rock shelf provides a ledge to lead us in. The Eyrie | The rock shelf upon which I stood to take this was slowly being consumed by the encroaching tide. It left me nervous and exhilerated. No monochrome here. Colour is something I intrinsically enjoy. Part of the joy of photography for me is the post-processing, where I can draw out the colour in all its subtlety or vibrance. Like watching a flower bloom, something magical happens and nature's artistry is revealed as I work at a photo with brush and gradient, slider and switch. Colour can sometimes compensate for poor composition, and I'm always conscious of this, but colour is part of composition for me, helping to structure an image, lead the eye and define the emotional content. Rocks @ Lorne Pier | Feeling the warm sun slowly push away the chill of an early morning, and watching as it lit the edge of the stones in gold, was almost a spiritual experience, made more profound by the softness of the ocean in the final image. Thanks for taking the time to view these favourites of mine. I hope your 2017 was fulfilling and that 2018 will bring more of the same to you and your loved ones. All the best.